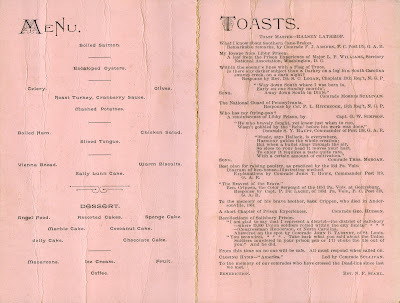 Four menus that survive from their reunions tell the story, which begins in 1886, when the association held their second annual banquet at the Wyoming Hotel in Scranton, Pennsylvania. 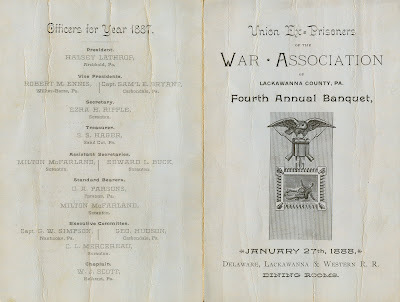 On the front of the menu below, there is an illustration of a fashionable young woman, and on the back, the national association’s logo, showing a guard dog attacking a prisoner, along with the motto “Death Before Dishonor.” These images make a startling contrast. 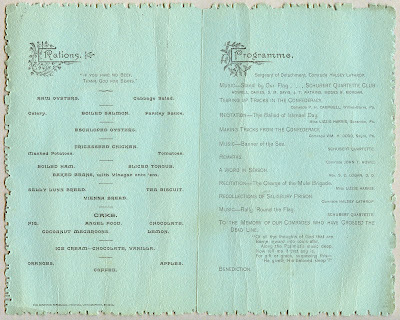 The lavish bill of fare also employs an unusual convention, showing the exact time each course would be served, starting at ten o'clock in the evening. 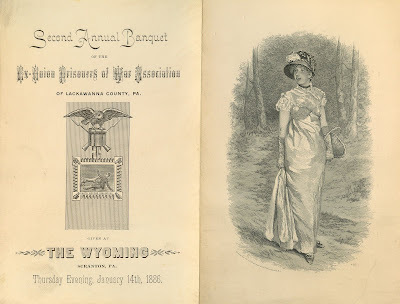 By 1888, the association had moved their annual event to the Delaware, Lackawanna & Western Railroad Dining Rooms. The national logo is now shown on the front of a gray cover, and the bill of fare is printed on pink interior pages. The simple dishes on this menu reflect the modest venue. The tone of the reunion in 1889 was distinctly different. 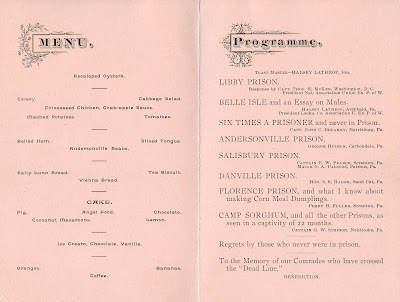 For one thing, the speeches focused on the prisons—Andersonville, Libby, Salisbury, Danville, Florence, and Camp Sorghum, the open-air prison in Columbia, South Carolina, where the main diet comprised cornmeal and sorghum molasses. 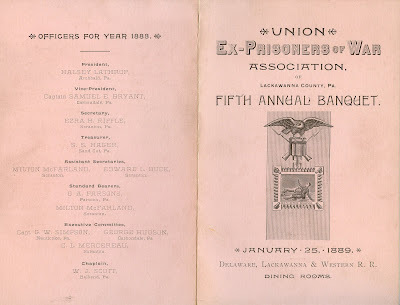 It would be fascinating to know what one of the speakers that evening had to say about “Florence Prison, and what I know about making Corn Meal Dumplings,” for food was very scarce in the Confederate prisoner of war camps, reflecting wartime shortages throughout the South. 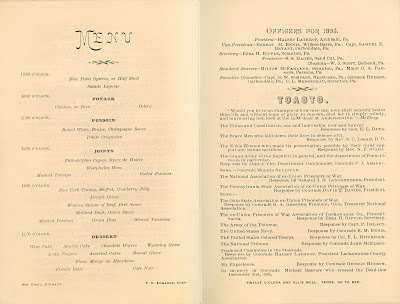 Interestingly, the fricasseed chicken on the menu below is accompanied by a crabapple sauce; crabapples may have been one of the items that prisoners were able to buy on the black market from the guards. 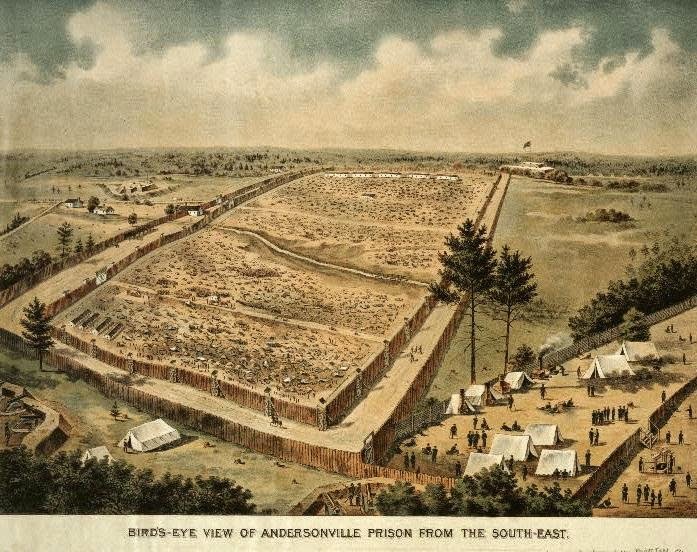 Although food was an integral part of their memory of captivity during the war, it was probably not a good idea to name the beans after a place like Andersonville Prison. Things went back to normal in 1890. There is more music scheduled on the program and fewer recollections of prison life. The dish previously called Andersonville beans is renamed “baked beans with vinegar onto ’em” on this menu. 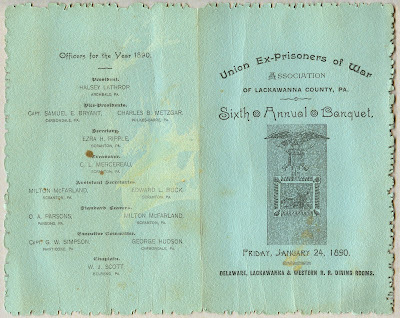 Regardless of where the event was held or how the dishes were named, these reunion banquets always ended with a toast to the memory of comrades who had crossed the “dead line”—the boundary that prisoners could cross only at risk of being shot. The reunion attendees must have had an entirely different way of thinking about food than we do. I hate to think about the hunger they experienced. My ancestor was the prosecutor in the Andersonville trial. Just a note that I put a notice about this interesting blog posting on the American Civil War Facebook page. Keep up the good work.